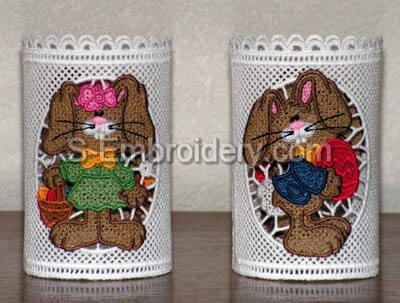 2 freestanding lace napkin rings. 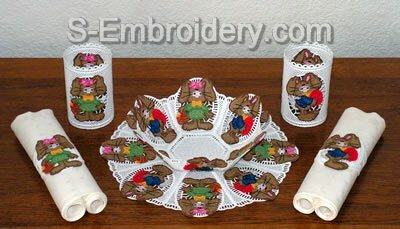 The different bowls and doilies are made by using the 2 Easter Bunny designs either separately or in a combination. 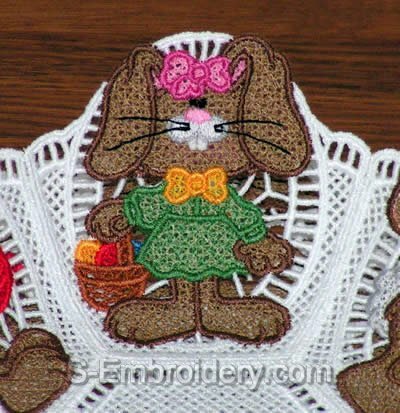 Delivery includes 10 machine embroidery files, design information and instructions in PDF format. You can create 3 different free standing lace bowl by using the 3 bowl designs. The bowl bottom is common for all bowls. It has a size of 3.78 x 3.27 inches (96 x 83.1 mm) and approx. 17,204 stitches. You can use it in combination with: a) bowl side panel #1 b) bowl side panel #2 or c) both side panels. The size of the side panels is up to 3.64 x 3.66 inches (92.5 x 93 mm), the number of stitches is 21,000 - 21,500 per panel and the number of colors is 11. You can create 3 different free standing lace doily by using the 3 doily designs. 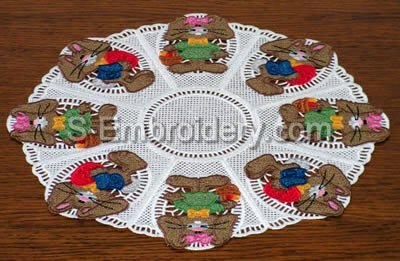 The doily center is common for all doilies and has a size of 3.63 x 3.63 inches (92 x 92 mm) and approx. 18,319 stitches. Similarly to the bowls, you can use the doily center in combination with a) doily side #1 b) doily side #2 or c) both doily sides. 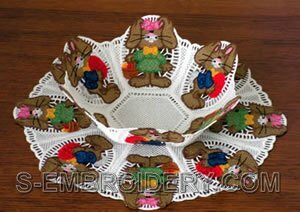 The size of the doily sides is up to 4.11 x 4.33 inches (104.3 x 110 mm), the number of stitches varies betweem 24000 and 24000 per side, and the number of colors is 11. The napkin rings have a size of 3.56 x 7.03 inches (90.3 x 178.6 mm) , the number of stitches is around 26,500 and number of colors is 11.